Donor publics have been misled about the nature of development: for decades they have been told that it is about charity and technical fixes, when in fact it is as much about fights as our own policy-making is at home. Aid practitioners work in a world of struggles for reform, but they are forced to misrepresent and obfuscate the reality of development in order to comply with very restrictive and selective interpretations of principles like accountability, transparency, ownership or harmonisation. That is the dysfunctional aid system that we in donor countries have built, and then shackled with a discourse that mistakes short-term results for long-term transformation. A different approach is possible, and indeed has been quietly applied by innovative development practitioners around the world who provide political coverage for reformers or build coalitions that open up spaces for change. 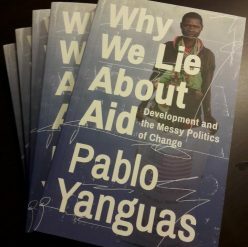 With real stories from aid practitioners in Britain, the US, Spain, Uganda, Honduras, Nigeria, Liberia, Rwanda and Ghana, this book explains what lies behind the much-criticized pathologies of aid, and challenges us to have a more honest conversation about development assistance.